Leanne working in the field (and the dark). 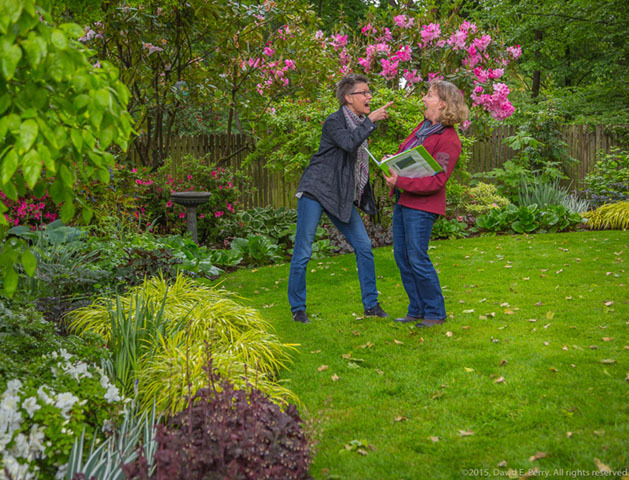 Leanne brings 25 years of experience designing and project managing the construction of those designs for residential clients in Seattle and on Mercer Island. She worked for three design/build firms before branching off on her own. 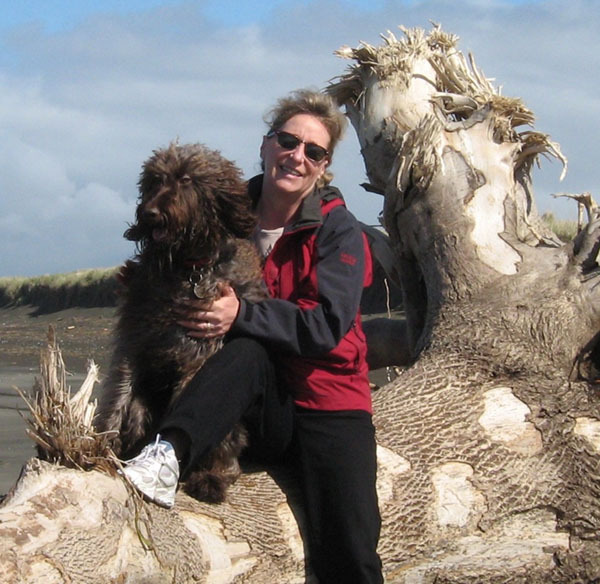 Leanne opened the doors of Terra Design in January 2006, survived the 2008s and is still the principal, secretary, accountant and chief dog-walker. 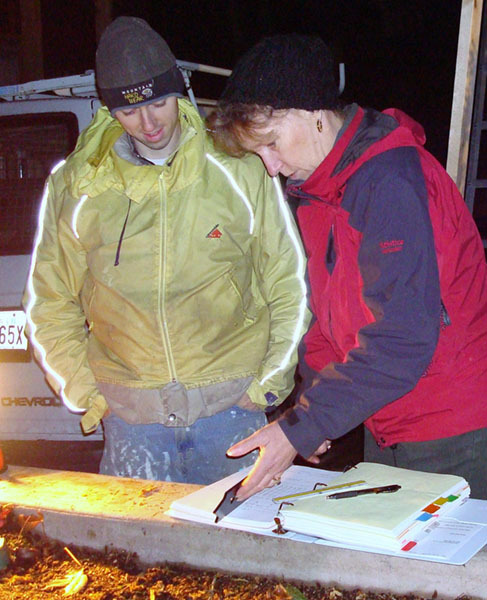 Leanne holds a BS in Biochemistry from California Polytechnic State University, San Luis Obispo and an Associate’s in Landscape Design from Edmonds Community College. Design, construction, and clients are what pique Leanne’s interest. She loves complex, multi-faceted projects. Every project is different, an endless array of possibilities and the process of refining, honing what is the best design, the best solution for the client(s) is infinitely satisfying. Then there is the absolute thrill of working with quality construction companies to bring it out of the ground, problem-solving, watching the two dimensional design being created in real 3-D, better than CGI (Computer-Generated Imagery). 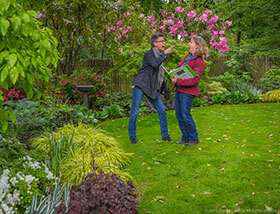 And the delight in working with clients, in that creative process, who will live in and love the gardens for years. What wonderful work! Screening the view from the neighbors. This small in-city garden had been decimated by an extensive home remodel. 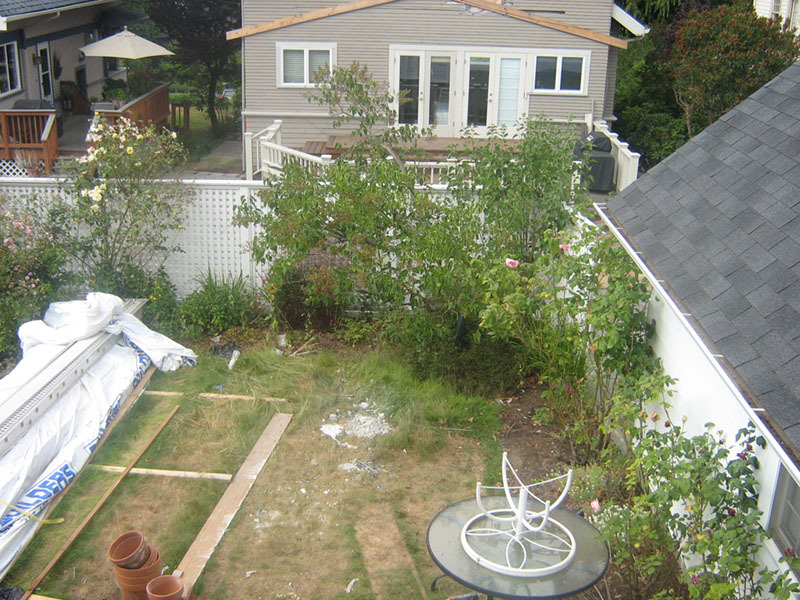 The backyard sits lower than the neighbor’s house creating a fish bowl that was uncomfortable to relax in. Additionally, the clients’ three story home is tall and with the garage on another side, there was a lot of vertical hardscape. 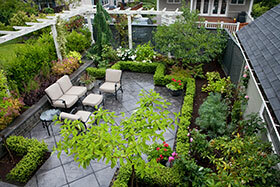 The clients had a former garden that they loved and wanted to recreate in their new home. We were fortunate to be able to visit that garden together. 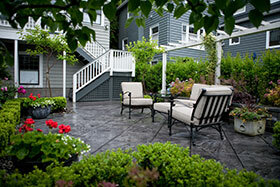 The first priority was to create privacy and an inviting, comfortable place to relax and/or entertain. An arbor along two sides with hedge and privacy fence create the walls that complement the garage and house. Proportion and scale were critical here, even more as it is a small site. 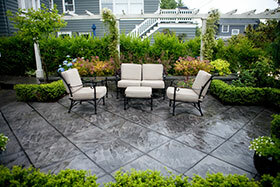 A Pisa retaining wall enhances the enclosure and doubles as extra seating. The existing lattice fence along the alley was stained dark green so that it retreats, mirroring the Ligustrum hedge and so the white of the arbor is dominant. 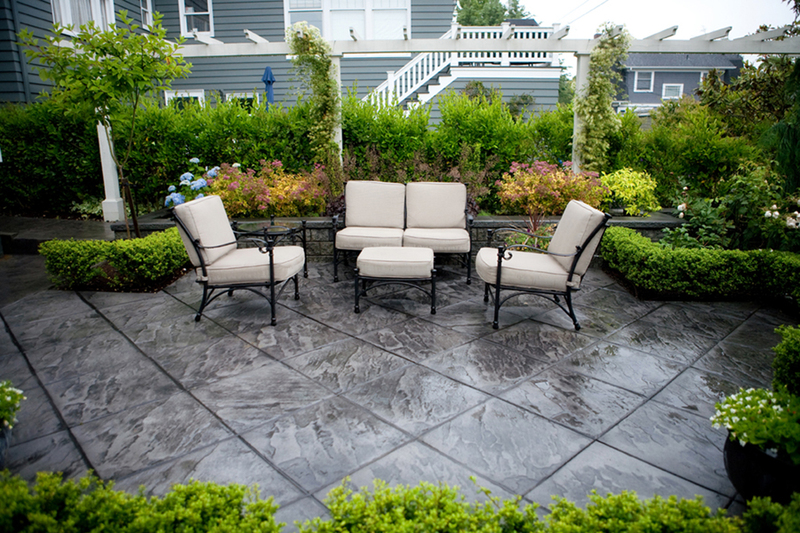 Elements from their previous garden were interpreted including a stamped concrete patio -- the diamond pattern plays well with the strong linearity of the design. 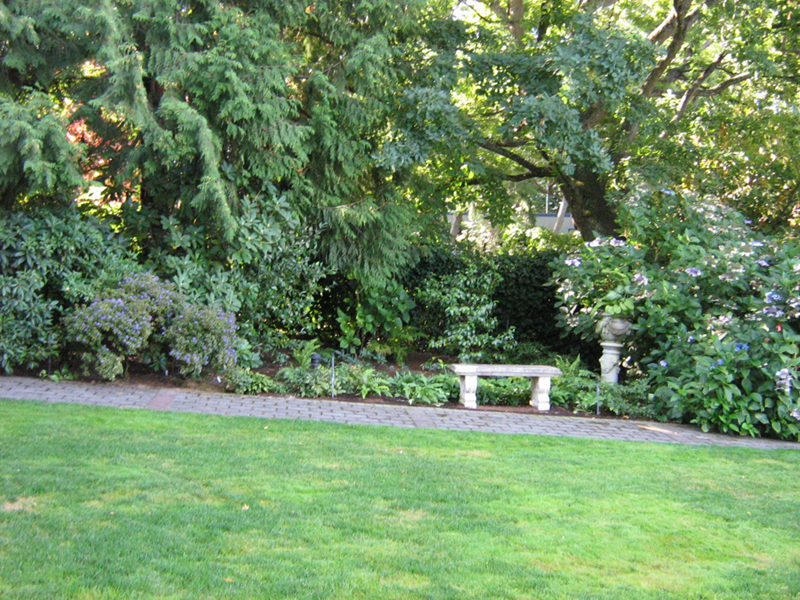 The seating wall is mirrored by a boxwood hedge and then filled with lush plants, Spiraea, Roses, Heuchera. PG Hydrangeas patio trees now arch over the entry into the patio, with a Weeping Alaskan Cedar camouflaging the utility pole (if one stands in just the right spot). 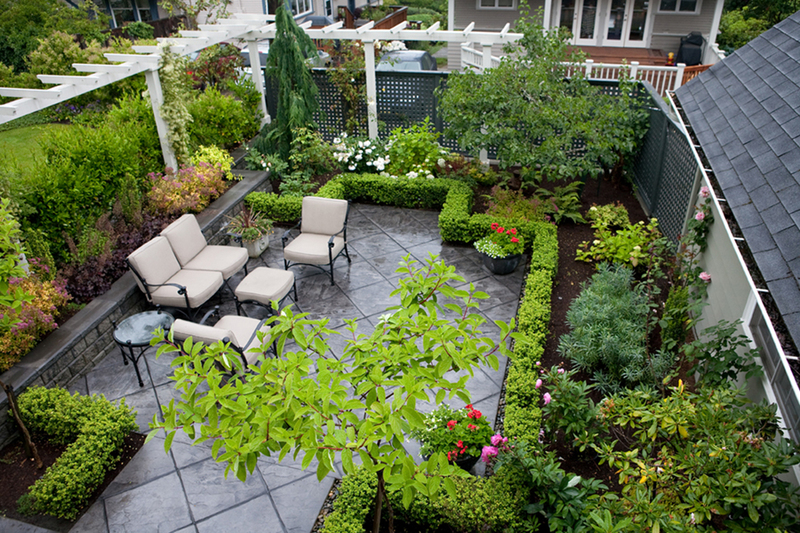 The hedges, evergreen tree and shrubs give the garden the structure so necessary in a space that is viewed and experienced year-round, the view from above being as important as the experience from the ground level. With the space being used as a construction site for the home remodel, the soil was beyond compacted, but a good sandy loam at heart. We did extensive soil renovation, rototilling the soil and then setting it aside to till the layer below, then adding 4” of Fertil-mulch and tilling again. The plants have thrived – the success a testament to the process. 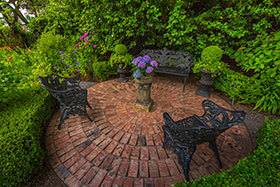 Main circular brick patio creates a place to gather. Pops of gold foliage knit the garden together. We have had the privilege of working with this client on a series of projects over the past 15 years. This iteration, perennial borders (one area of a mature landscape) were wonderful in the summer but needed structure in the winter when all the perennials where dormant – a prime view from the house in the dark months. The space is long and proportionally narrow, running 120 linear feet x 14’ deep on one side and 12’ on the other. Mid-project a neighbor’s mature oak fell in a storm with its roots up ending plants and fence and dramatically altering a shady bed to sun filled. A series of three circular brick patios are connected by a curvilinear black crushed marble path with steel edging. Brick matches the existing material as well as complements the English garden style. 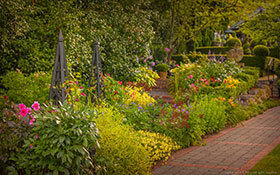 The shape allows entry and exit at any place on the circle which is useful in this long, narrow space, allowing one to stroll through the gardens enjoying the lush plantings. 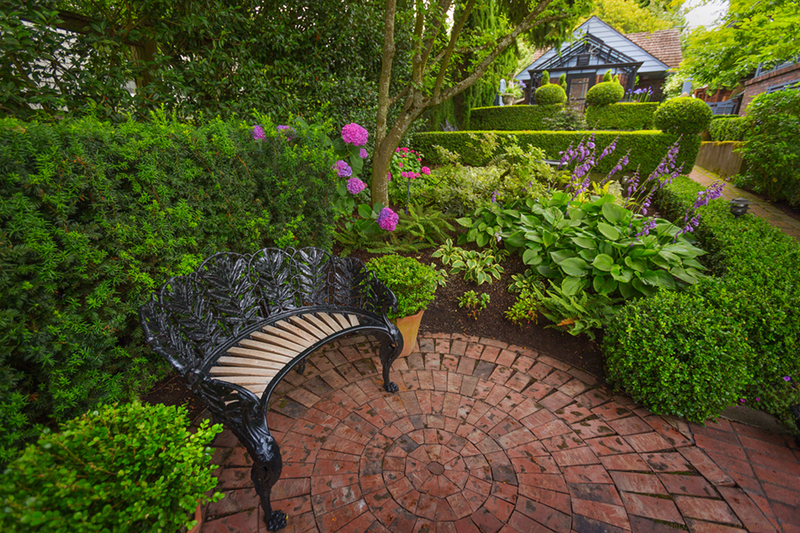 When the client returned from England with antique cast iron benches, one for the circular patio, one to spare, we created a half-moon brick landing on the south border with a topiary boxwood hedge sculpted to show the bench to its best advantage. A Cercis Canadensis ‘Forest Pansy’ was added to replace the height and structure lost with the falling of the Oak next door. 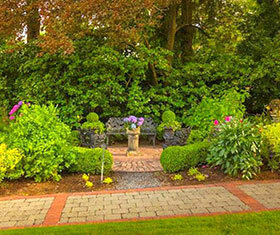 Boxwood hedges and wonderful architectural accents the client has collected give the garden structure, age and pizazz. 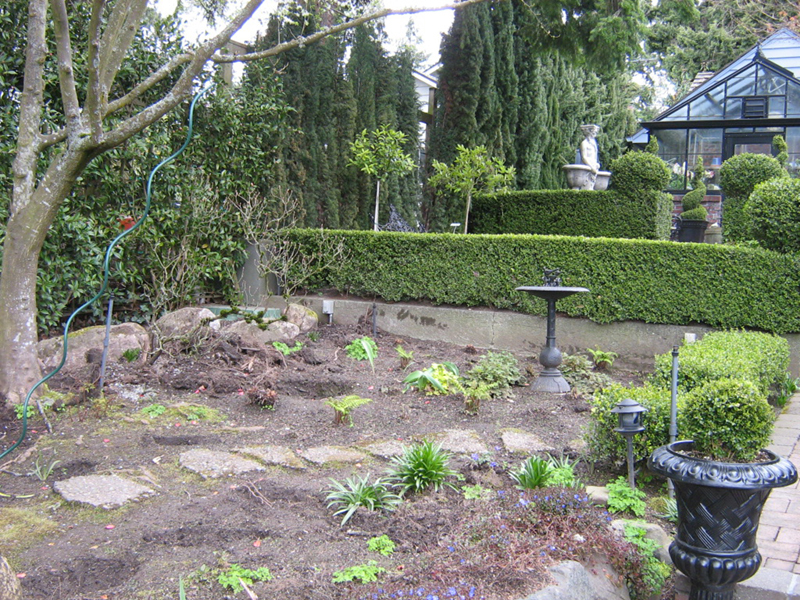 In considering options for the retaining wall, the client requested a more casual, aged approach. A broken concrete wall “aged” with an acid stain fills the need. 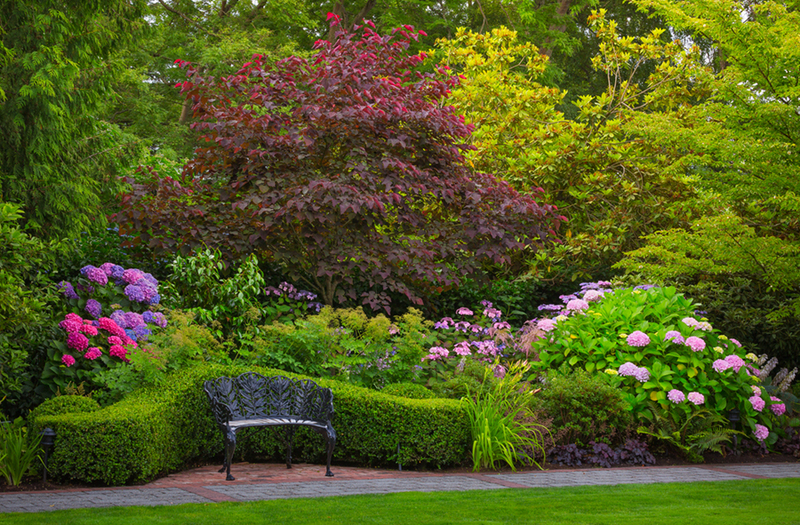 A mature backdrop of Rhododendrons, Camellia, deciduous and coniferous trees run both sides of the property. New shrubs were added and the existing perennials (which were lifted and inventoried) were augmented and replanted in colorful masses. 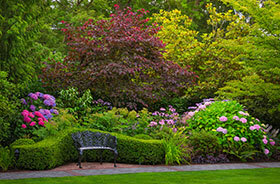 Plantings are in the forefront of this garden with careful consideration of texture & color. It is a luxury, in this day of busy professional clients, to be able to recreate a garden that requires regular detailed maintenance. 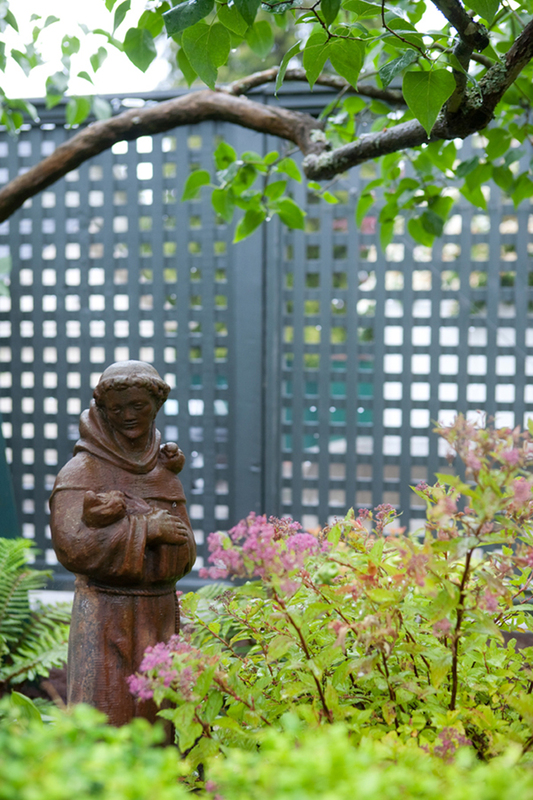 This garden is the antithesis of low-maintenance. 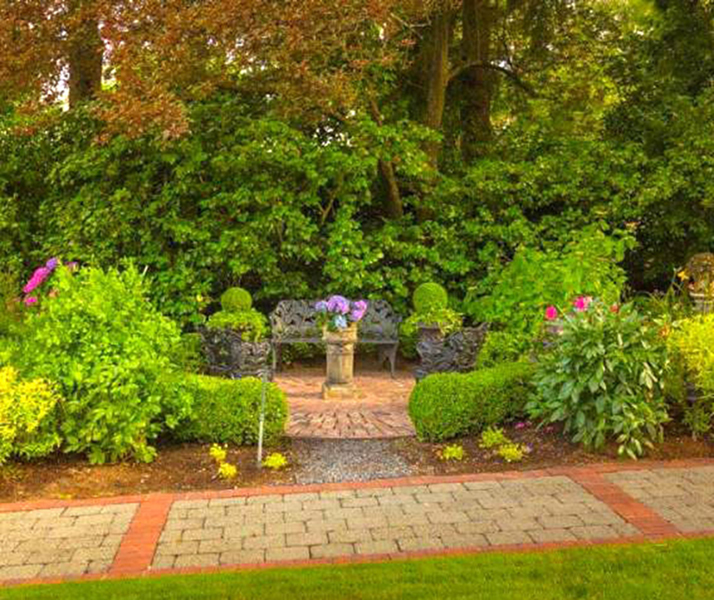 The client is an avid gardener who maintains this garden with the assistance of talented professional gardeners on a weekly schedule. With such care, the garden just gets better every year.